Millions of people see Stacey J. Aswad, 24/7, on TV as the Host for Walt Disney World’s “Top 7 Must Sees” and “Must Do Disney”! 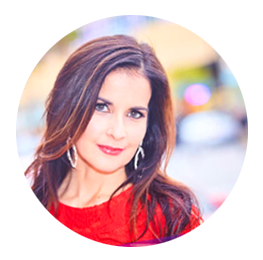 Stacey is a working voice actor, actress and host and some of her clients include The Ellen Show, McDonald’s, AT&T, Time Warner, Busch Gardens, Acura, Regions Bank, Bud Light, Clairol, Subway, Selsun Blue and Toyota. Some of her TV, radio and theatre credits include Adventures in Odyssey, Discovery Kids, 7th Street Theater, One Tree Hill, Notes from the Underbelly, Me & You, Us Forever, Five Women Wearing the Same Dress and Carrie Ann’s Kiss. She was also the In-show Announcer for Season 3 of the game show, Family Game Night airing on The Hub / Discovery Family. Stacey has won five national championships in artistic roller skating and she wore the same skates to host home games for the WNBA’s Los Angeles Sparks at the Staples Center in L.A.
She has a BFA in Dance from the prestigious Juilliard School in New York City. She hosted the award-winning documentary “Finding Kraftland” that screened in more than 80 film festivals around the world. Many of her former dance students from the Youth Performing Arts School have gone on to become superstars in pop music, film, television, Broadway, professional dance companies and dance education. To learn more about Stacey, visit www.staceyjaswad.com.